With the holiday season in full swing, it’s time to think about that yearly opportunity to give to friends and family. We get it. You’re busy, there are ninety-nine plus things to do as you’re expecting friends and family to visit. Well, pause right there and get the coffee brewing. Here at Enviro-Dry, we’ve got your back with gifts for clean freaks in your life. Are you spinning your wheels trying to figure what to buy? This collection of 11 gift ideas should give you a few ideas, saving you time and giving you a coffee break. Now, how about those gifts for clean freaks? We have 11 fun ideas — even the reluctant cleaner will want to clean with some of these gifts on hand. To begin our fun, zany list of gifts for clean freaks, we have the musical hand wash timer. This pump topper goes on soap pumps. This top will play the song “If you’re happy and you know it” when you press down the pump. The song helps kids learn proper hygiene. The song itself is a timer, so the child knows that he or she must continue washing and scrubbing until the music stops. 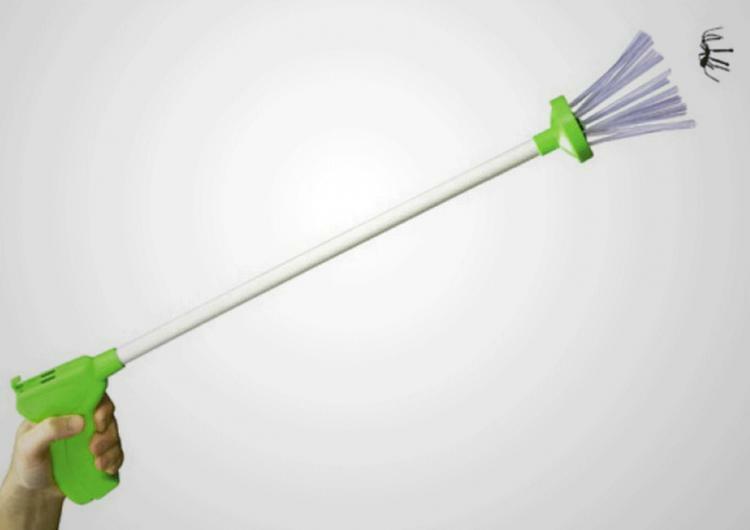 This “Bump It Off” cleaning rubber brush is eco-friendly and easy to clean. It removes stains, lint, and fur from fabric. In the kitchen, you can use it to clean fruits and veggies. Kitchen surfaces can be thoroughly cleaned without scratching. For beauty, you can use this brush to exfoliate your body or clean those makeup brushes. You can even use it on pets to brush loose fur off your pet. It’s a great grooming tool. For that extra boost of cleaning power, there’s nothing quite like the scrubbing power of the drillbrush. Blast away dirt with the nylon brushes that attach to your cordless drill. The brushes don’t scratch your kitchen or bathroom surfaces. In the minds of some, the idea of catch and release doesn’t come naturally when it comes to dealing with pests. Regardless of your philosophy on catch and release, the My Critter Catcher enables you to safely catch beastly, creepy crawly critters. Then you can safely dispose of them outside. Even the kids can use it with no direct contact with the offending insect. To be sure, you’re not all alone in the annoying conundrum of having a pesky fruit fly infestation on hand. These pumpkin-shaped fruit fly traps can be set in your kitchen’s basket of fruit. Inside the pumpkin, you can add apple cider vinegar to lure the flies into the trap. It’s easy, non-toxic, and a sure win in the fight against fruit flies. OK, so maybe this doesn’t qualify as fun unless you think that being spared from a trip to the dry cleaners gives you more time to have fun. This garment deodorizer is basically a home dry cleaning kit. It deodorizes your clothes and saves you money on dry cleaning bills. This cute llama duster is the perfect desktop cleaning pet. The llama is bendable and is 14 inches long when straightened. It’s simple to clean — handwash or shake it out. Here’s a really fun one. We all know what the Chinese Takeout box looks like. How about an oversized Chinese takeout box for a laundry hamper? This one is almost 2 ft tall and is made out of 100% polyester material. Why make cleaning a drag when you can have fun by cleaning with these fluffy cute animal slippers! Your feet are kept warm as you catch dust and dirt while walking through your home. Cleaning and walking is the ultimate multitasking experience. Now how about buying a set for each member of your family? For your lens cleaning and screen cleaning needs, this microfiber skinny necktie will deliver. It’s trendy and versatile as a lens and screen cleaner. Wipe away the smudges while looking dapper. Here’s one for the reluctant cleaner — a robotic fur ball vacuum cleaner that does the vacuuming for you. This colorful ball makes its rounds through the house, picking up the dust bunnies and dirt. Have a merry, bright, and clean Christmas! Happy shopping as you make your gifts for clean freaks decisions! May your time with family and friends be blessed and may your house be clean. We have more ideas where these came from. Have you thought about a baby cleaning suit?